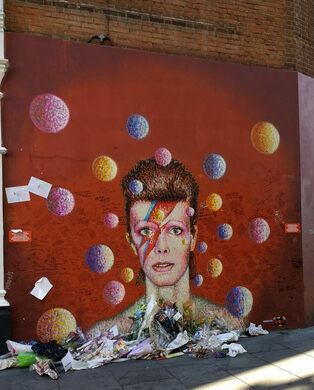 A mural of David Bowie, as bright and colorful as the man himself, is painted on a wall of Morley’s Department store, opposite the Brixton tube station. The graffiti artwork is the work of Australian artist James Cochran, who completed the portrait in 2013. It features Bowie, or alternatively, Ziggy Stardust, as he appears on the cover of his 1973 album, Aladdin Sane. Bowie explained that the vibrant lightning bolt across his face represented duality of the mind, and it remains a popular cultural image today. 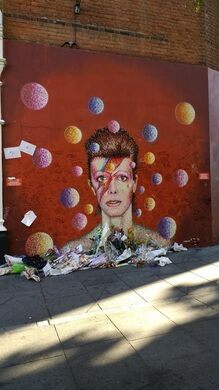 The mural can be found by passerby in Brixton, the London district where Bowie grew up. The singer and musician, who has been called “rock’s greatest self-reinventor,” was born on 40 Stansfield Road, right around the corner from the present-day mural. 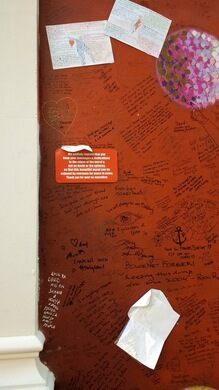 In the days following Bowie’s death, on January 10, 2016, thousands of fans visited the mural to pay tribute, leaving notes and flowers and taking photos, with some arriving with the same lightning bolt across their faces. 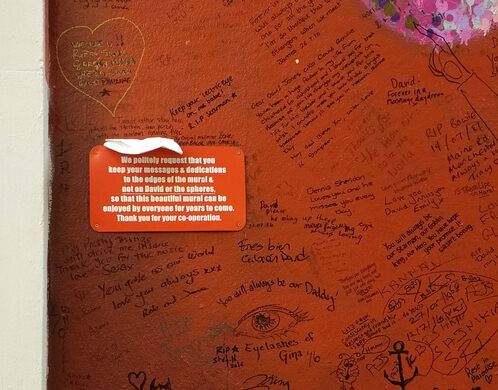 If you can’t make a trip to the mural, maybe you can get your hands on a local bill. Brixton is known for having a local currency called the Brixton Pound, which launched in 2009. Bowie, Brixton’s most well-known resident, is featured on the B£10. Tunstall Road, Brixton, next to Morleys. Directly across from the exit of Brixton Underground station (Victoria Line).